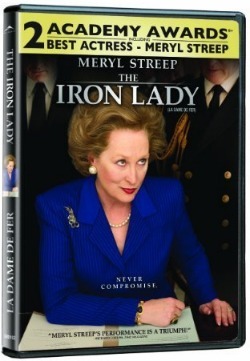 In the bonus features of [amazon_link id=”B0059XTUXQ” target=”_blank” container=”” container_class=”” ]The Iron Lady[/amazon_link], now on DVD and blu-ray, director Phyllida Lloyd describes the movie as “a wonderful quirky love story and the audience will love it.” That’s true. If you haven’t watched it yet because it seemed more like a historical movie about the life of Britain’s Prime Minister Margaret Thatcher than a love story, you’re missing out. It’s both. The Iron Lady stars the legendary Meryl Streep, who won an Oscar for the role, in the story of Margaret Thatcher, who served as prime minister for more than 11 years and defied the traditional female roles of her time to set out and change her country. The film starts where most films end, with an aged Thatcher fighting with the dementia that’s robbed her of her memories. The story instantly pulls you in emotionally as Thatcher talks to the ‘presence’ of her late husband Denis (played brilliantly by Jim Broadbent). She has moments of reflection and clarity as the 105-minute film flashes back and forth between memories of her life at various ages. At no time did it leave me confused as to where we were. The movie is filled with unforgettable quotes from Thatcher that begin when she’s a young Maggie Roberts, portrayed by Alexandra Roach. When Denis Thatcher asks for her hand, her response is, “I’m not going to be one of those women, Denis. One’s life must matter. I cannot die washing up a tea cup.” He explains that he’s marrying her because she IS that kind of woman. The movie has many memorable images of Thatcher’s life, including her first walk into the Parliament in a baby blue outfit in a sea of bland men’s suits. Stepping into the ladies room, she finds an ironing board and a chair. These split second frames speak volumes. 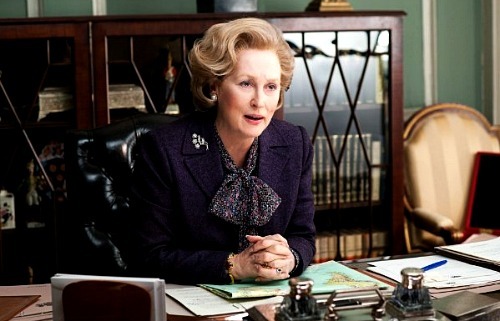 But let’s face it, The Iron Lady wouldn’t have been what it is without Streep, whose impression of Thatcher is spot on, down to her vocal inflections, mannerisms and, of course, amazing makeup and clothing. The chemistry between Streep and Broadbent is also palpable, and their scenes together are a highlight of the movie. I enjoyed the special features, which include The Making of the Iron Lady, a great peek into Streep’s portrayal, as well as how the costumes and sets pull the movie together. And remember, I’m not one for historical-type movies. It also features a montage of other films released around the same time that focus on some part of history, from The Artist to My Week with Marilyn. Overall, I’m not into movies about politics or political history, so it’s the love story that drew me in. But it didn’t take long for me to get fascinated by Streep and even with Thatcher’s life. I even looked up more of her quotes after the movie. Definitely worth a watch. Okay now it is confirmed that I need to watch this- This is the umpteenth great review– and I do so love Streep- (fell in love with her in “Out of Africa”)…I MUST got and get this and watch it!!! Ooh, love Out of Africa. Such a gorgeous movie. My father-in-law recommended this movie to me, but I don’t want to watch it, just yet because our taste in movies is way too different. but after reading your review, I will give it a shot. this was playing in theaters this winter when I was in Glasgow. though I didn’t have a chance to see it then, I found it a bit startling to see Streep’s/Thatcher’s image all over city transport. still not sure how I feel about seeing the movie, although I like Streep too — though one of my favorites is her maybe playing against what you would expect of her role in River Wild. I still haven’t seen River Wild. It’s hard to imagine her in an action-adventure type movie. it’s worth seeing for the scenery alone, actually. the actors — with Streep, Straithairn, and Bacon you know the acting is good — make a lot of a fairly basic script. Streep said at the time something to the effect that that she thought she’d do a movie her children (fairly young when she made this, I think) would enjoy.